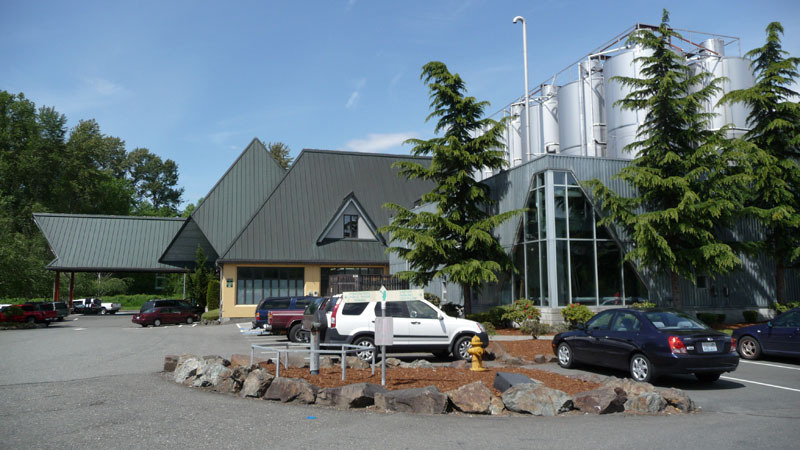 The Redhook brewery is in a semi-rural area, more or less between two wineries in the wine tourism destination of Woodinville, Washington.. The buildings have a modern, vaguely Chateau look with steep brown metal roofs. Forecasters pub is at the back of the property. The pub has a small gift shop on the right as you enter and a bar area on the back side with a long black wood-topped bar and a number of tall formica-topped tables with tall chairs. This is separated from the larger dining area by a low wall. 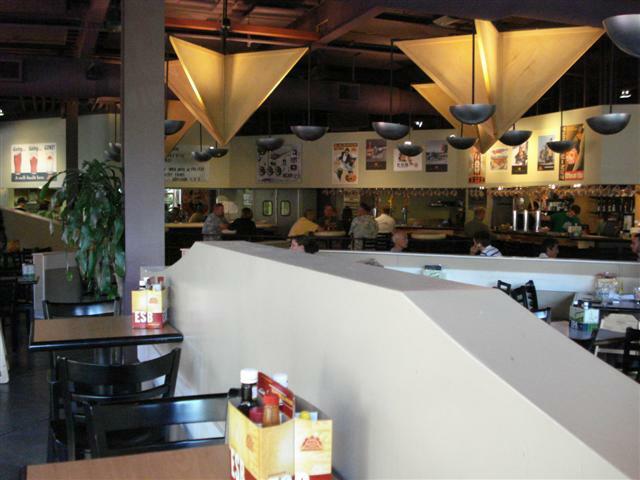 Many similar style, but lower, tables and chairs fill this area. Overall, itâ€™s one large roughly triangular room with windows on two sides. The ceiling is dark and very high and the floors are concrete. On one side is a fireplace surrounded by several couches. Interesting star-shaped light wooden structures hang from the ceiling throughout and together with some suspended polished metal hemispheres help to reflect and diffuseÂ the light from nearby spotlightsÂ onto the tables below. It is generally very loud inside due to the music and people talking. The patio, however, is the place to be. Itâ€™s a large concrete semi-circle, raised about four or five feet higher than the surrounding area and enclosed by a dark green iron fence with its spires arranged in a fan pattern. Comfortable wooden park benches rim the area as do several trellises supported by green metal posts and covered by hop vines providing shade. The rest of the area has wooden picnic tables and small trees in concrete planter boxes. The view from the patio is of the surrounding tall trees, lawns, and also a small glimpse of the working brewery with its tall grain silos. Regular brewery tours are scheduled daily. It cost $1 on our latest visit but you can keep the souvenir glass and can taste five beers for the price. 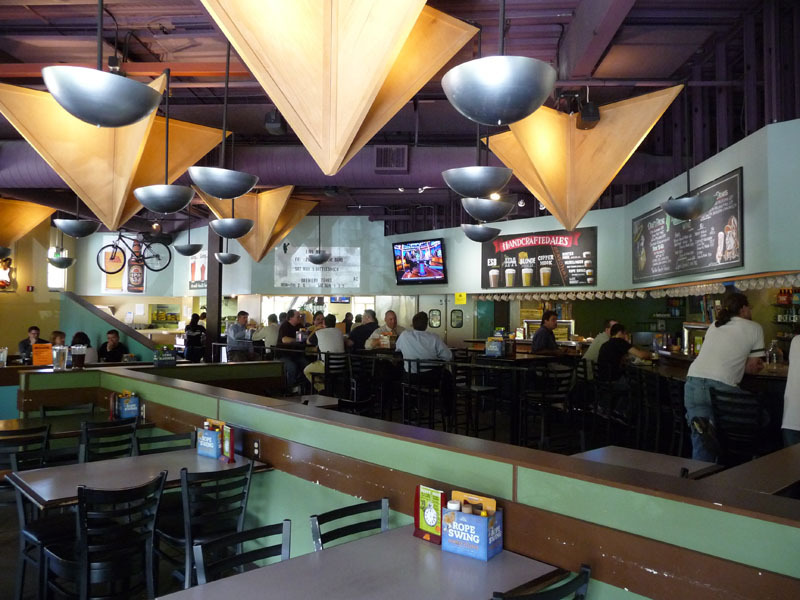 The beer selection is reasonable, including several brewerâ€™s special choices and a seasonal, which can be more innovative than the standard Redhook line of five year-round beers. Food is well made, if conservative in execution and concept. Many of my beer loving friends have low opinions of Red Hook and their Public House. I, however, rather enjoy the place and it's beer. That said, it's weakest link is in fact the beer. It's an easy task to find better in the greater Seattle area. I also agree with others here that the Forecaster's PH is not somewhere that I would normally visit. I haven't experienced the pub atmosphere or, you might say, personal touch that I prefer. I'm fine with that. I don't go for that atmosphere. It's a fun place to go with friends to the various events that they put on. I appreciate the effort to entertain in a way I don't normally go for. Trivia night is very lively, and they have a giant inflatable screen that they play good movies on in the summer. I guess you could almost say it's better to bring friends, rather than to try to meet new ones. Finally, the pros of their beer selection. While not exemplary, the beer is solid. The ESB is one of my favorite "with meal" beers, and other good choice is the Porter. While not as good as many other Porters available, the fact that it's an easy drinking beer means that it's more enjoyable in warm weather. I recommend trying the seasonal selections as well. Finally was in the area to stop at Redhook. Was not what I expected it was huge and had a restaurant that was pack to the gills. We had a great lunch good pub food and we where stuffed. I got to take the tour and well I saw a huge production brewery reminded me of another huge production brew site. I was able to try some great beers at the end and once they saw I knew what I was talking about they gave me more attention. Then the good stuff was broke out. I got to try some experimental brews that have not even been named. Some where a Belgian triple mixed with a chocolate beer that was a tasty little treat. Had a blast on this stop and was sure glad I finally made it. I will be back thatâ€™s for sure and I hope to try some more great Redhook brews. I have to agree somewhat with Curmudgeon -- This has definitely turned into a "large brewery" tourist destination. However, if that's what you like -- it works for that. I would say that Redhook beer is still better than the large domestics -- and their seasonal is usually pretty good. The food is decent, the music is loud, and the beer is plenty (and somewhat pricey) -- great place for the younger, touristy types. And it's always fun to visit an active brewery and they do have tours. I happen to live in an area where hops (and therefore, good beer) is in great abundance and demand. Also, I am married to a woman who loves beer & would rather order a pint at dinner than a Pinot Gris. Consequently, I am as particular about my beer as I am about ice cream -- and we won't go there. 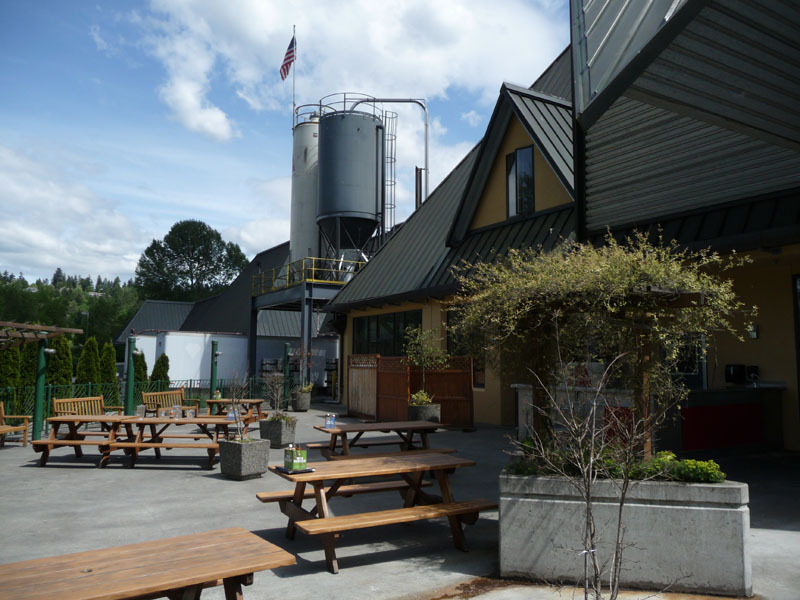 So, after reading the recent reviews for Redhook's brewery in New Hampshire, I felt it important to add my comments on our local monolithic Redhook in Woodinville, WA. Situated in a valley that's rapidly becoming over-run with warehouses & still more shopping malls (don't we have enough already?) Redhook does business sitting on 10+ acres of lawn, evergreens & water...big enough to be deemed an "amphitheater. 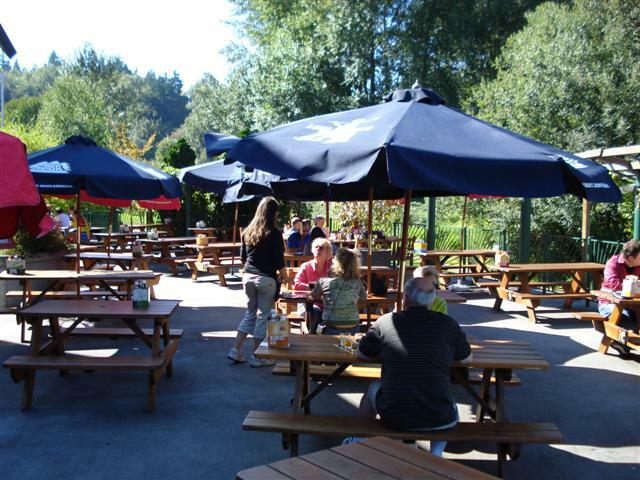 The beer garden in the summer is WON-derfully spectacular. But the Beer...ah, the beer. Redhook began in 1982 and "was modeled after spicy Belgian ales." Not anymore. In 1984, Ballard Bitter came along & Washington natives have described it as "un-real" and "completely original." "Nothing like it ever...or since." Don't expect to get a taste of this special brew either. It's long since vanished in the overwhelming vastness that has become Redhook. 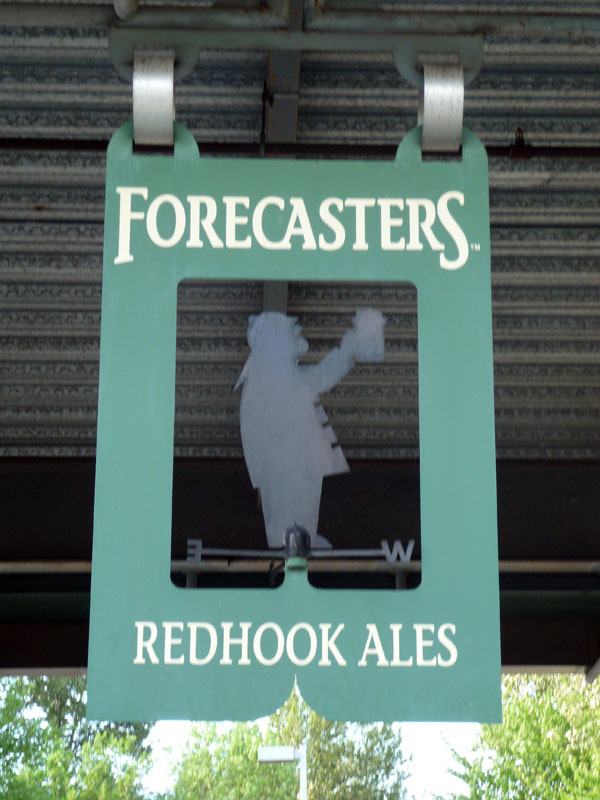 What they do have in the Forecaster's Pub are 6 beers always on tap: Blonde Ale, IPA, ESB (their so-called flagship ale), Blackhook Porter, Nitro-pour Porter, a double dry-hopped unliftered IPA and a seasonal, in my case, a Sun Rye. Their menu is extensive & diverse w/hummus and edamame (roasted soybean) appetizers, burgers, pulled pork sandwiches, mahi mahi & pasta entrees. The service is fine but the community atmosphere that Persimmon & I desire is non-existent. The music is up to decibel 9...the dining room is massive (and usually crowded for lunch & dinner), the food prices are too spendy and the beer has become un-imaginative. Redhook has a "minority" shareholder - Anheiseur Busch owns approximately 1/3rd of the company - so distribution is national and when that happens, the first thing to suffer is the quality of beer along with the character & personality that brought people through the doors in the first place. Again, I'm a lucky man -- I have such a diverse selection of places and beers from which choose that I'll admit, I might be quite the curmudgeon. If I lived in say, North Dakota, perhaps I would feel differently. Nah...because I would hazard a guess that the one brewery in Fargo has more personality & sense of comaradarie. As Albert Einstein said, "Life is too short to drink bad beer" -- anywhere!